On the evening of Friday 13 January tragedy struck the Italian cruise liner Concordia, owned by Costa Cruise Lines, part of the Carnival Corporation. At this point we will not apportion blame. That can be left to a Court of Enquiry. Strangely enough it is 100 years since an accident at sea gained such media coverage, and that was Titanic. Cruising is safe and to be recommended for a fine all-inclusive holiday. Seven are missing and 25 are confirmed dead and bookings at Costa have fallen by 80% to 90% on the previous year. How long will it take to recover? We do not know. Rebranding is an option, with the 1996 example of the fatal ValuJet crash in the Miami Everglades. ValuJet became AirTran and is now part of Southwest. Costa will have to change the distinctive funnels and likewise come up with a new name. Over the years the aviation industry has had to contend with many a predicament and is well geared up to deal with each emergency. Clearly this is not the case with the cruise business. With very few Americans on board the US media did not wake up to what was happening near Giglio until several days after the event. Chairman Micky Arison was rumoured to have told his ten operating cruise companies not to make any comment at all. It was a Costa matter and Costa functions as an autonomous division of Carnival. Costa should deal with it. He was probably right. But where the industry really went wrong was in London, effectively the European centre for cruising and very much involved with the Concordia cataclysm. It was a PR disaster. What should have happed was that industry representatives made themselves available for press, TV and radio interviews and enacted a crisis programme. It is not easy and involves hard work and knowledge of what you are doing. Whoever gets in first sets the tone, and TV in particular, strange animal that it is, leads the way. News and programme slots are usually limited and for the most part balanced views are offered. With Concordia the technical experts had a field day explaining the possible causes and problems with large ships. The industry (and it had to be the industry rather than a single cruise line) should have been putting up its own people taking away talking time from the hastily discovered ‘experts’, some with an axe to grind. A single statement offering the standard condolences just was not good enough. Let us look at two aircraft crashes and a classic example of turning a calamity into at least a PR win. At Kegworth BMA Chairman Michael Bishop (now Baron Glendonbrook) was quickly on the scene and gaining press sympathy. Pan Am collapsed in 1991, not because of Lockerbie, but it did not help. BMA is still with us (just). But the greatest example of all is Dunkirk, a terrible catastrophe. Somehow Winston Churchill changed that event into a PR victory. Clearly one cannot compare Concordia with the English Channel miracle but it does demonstrate what can be done. This must be one of the weirdest reports on a cruise ship offered by AERBT. 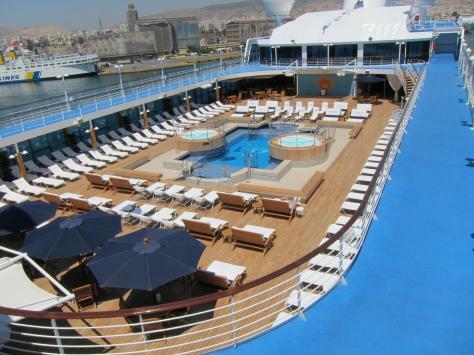 Insignia is no longer operated by Oceania Cruises and in April will join Hapag-Lloyd as Columbus 2. However its two sister ships Regatta and Nautica remain in the fleet and are likely do so for several years at least. Whilst the experience was Insignia the review is for potential cruisers on Regatta and Nautica. The ships are virtually identical. Oceania is a young cruise line founded in 2002 and is owned by New York-based Apollo Management, which also controls Regent Seven Seas and has an interest in Norwegian Cruise Lines. Regent sits at the top of the luxury market with Oceania tackling a slightly different upscale spot with what it terms is “country club ambiance”. Smart dressing is very much in order but leave your tuxedo behind. The 630-passenger Insignia is replaced by the purpose-built Riviera, twice the size and twice the number of passengers. 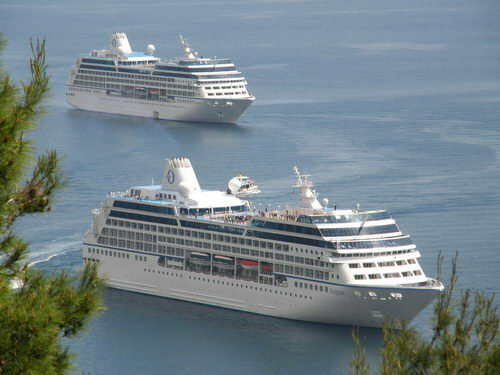 With her sister ship Marina, introduced last year, Oceania has become a four-ship flotilla. In the mid-1990s Renaissance Cruises placed an order for eight identical 30,277 gross ton vessels with Chantiers de l'Atlantique shipyard in France. R1 was delivered in June 1998 but with the company already under financial strain 9/11 was the final straw and the cruise operator was beached later that month. However the R class ship concept was right. Boutique vessels capable of docking in the smaller ports and visiting bays and inlets outside the scope of large cruise ships. Once out of the hands of the lawyers all the ships have been kept busy in recent times operating for a number of established cruise companies including Azamara, P&O, and Princess. However there is no doubt it is Oceania that has set the standard for the others to try and equal. As a new company into the market it had to offer an outstanding product, and has done so. The hull is now white, it was dark blue originally, and teak decking laid in the pool area, jogging track and balconies. There was not that much wrong with the original R1, but Insignia is just that bit smarter and sharper than its sister ships operated by competing companies. It also offers what is termed Concierge Class, larger cabins with Butler service, a bath, Champagne upon arrival and special facilities. Plus a private lounge. Everyone gains soft drinks, bottled water, teas and coffees, and 24-hour room service. Young persons are welcome on board especially during holiday periods where Oceania offers its Club Mariner. There are special savings for children or 3rd/4th person sharing. It does depend on the ship and sailing, but as a rule of thumb, it is around 50% off. We joined Insignia at Valparaiso, the port of Santiago (Chile), after a short stay in the capital. LAN Chile and the Grand Hyatt were both excellent and to be recommended. Santiago is a bustling prosperous city with an interesting history and some excellent restaurants. Boarding could not be easier with priority given to Concierge guests although there was no queuing for anyone. The 17-day voyage was to take us as far north as Lima and south to Puerto Chacabuco and the South American Fiords. Machu Picchu was visited, the highlight of the trip. Different cruise lines offer different styles of cruising. For the most part Oceania, certainly in its European agenda, concentrates on a very high-class touring style schedule, with most days in port and even overnight stays programmed. Not so for South America. The sea days are for quiet relaxation perhaps in the Canyon Ranch Spa Club, or for the more energetic the adjoining fitness centre. The library, high up amidships, is terrific, and there is also a small casino. Enrichment port lectures also fill the day but it is not a ship for bingo and noisy deck games. Small card schools emerged and tucked under a blanket “Movies Under the Stars” is a pleasant way to catch up with the movies. As the new kid on the block Oceania had to be outstanding in a specific area and offer real value. The dining on board Insignia is exceptional with open meal times and the choice of four restaurants in the evening. Other than wine there are no supplements to pay and the menus, by chef Jacques Pepin, are varied and interesting. The Grand Dining Room seats just over half the passengers at any one time, Americans tending to rush in early, whilst Europeans, and Italians in particular, keeping the staff up late. No overcrowding. It is just nice and steady throughout the evening. Caviar is on the menu if that is your taste but if you need kosher or a special diet that is no problem but you do have to advise ahead. The cuisine is exceptional, and we are told, to an even higher level on Marina and Riviera with Jacques (French) and Red Ginger (Asian) restaurants added. 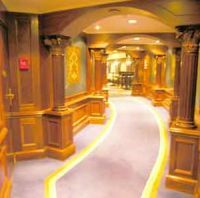 The those two ships also offer the “Bon Appetit Culinary Center” with professional instruction. It is part of your package. On Insignia the alternative dining is Polo Grill, American style steaks and shellfish, and Toscana Italian dining at its best both with set menus and daily changes. If you really want to relax completely and serve yourself there is the Terrace Café. 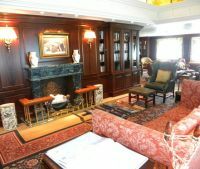 Although there are exceptions, the six Owners Suites for instance, each of nearly 1,000sq ft, essentially the ship is divided into three sizes of cabin. Sitting one deck down very conveniently from the pool area and Terrace Café the Penthouse Suites are large balcony cabins, lavishly appointed and around 320 plus sq ft in size. This is Concierge Class. Daily newspapers too and tea plus delicious hors d'œuvres in the late afternoon. The bulk of the staterooms offer a balcony, sitting area and around 165sq ft of space, plenty for a two-week holiday. They are very comfortable and sitting out on the balcony for breakfast is pure pleasure. The ship’s wi-fi system copes wherever you are. There are a number of cabins hidden behind lifeboats and a small number of internal offerings. There is plenty of excellent live music and social gathering. The show lounge on the R class ships is small and ideal for cabaret and less suitable for extensive stage shows that some lines are noted for. What it lacks in extravagance it more than makes up for with style. However it seems on the summer European programme, with its busy port visits, all the clients require for the most part is for a fine dinner and then a quiet evening. Berlitz rates this ship at 1,574. The similar Azamara Quest (R7) comes in at 1,466 and Ocean Princess (R4) at 1,487. AMERICAN CRUISE LINES, which specialises in small ship cruising along the inland waterways and rivers of the United States, is completing a brand new 150-passenger paddlewheeler, the Queen of the Mississippi, at Chesapeake, Maryland. Staterooms feature large private balconies with sliding glass doors and all of the amenities expected by today’s travellers. SWAN HELLENIC has confirmed that Minerva is back in service following a multi-million pound winter upgrade programme. Clearly the most obvious is an additional 32 balconies to existing cabins, increasing the number of veranda suites to 23% of all accommodation, a very neat and well carried out engineering exercise. Also new is a forward facing observation lounge and bar – the Orpheus Lounge – on the top deck, providing guests with expansive panoramic views. A dedicated internet lounge has been added, but it is chargeable. Experience has shown that satellite connected internet works well at sea, if sometimes a little slow. There is a new outdoor walk round promenade deck and the old en-suite facilities have been entirely replaced.